In the second half of the nineteenth century, still early in the history of animated film, were invented various optical devices that sought produce on the observer the visual sense of movement from the successive projection of images, silhouettes, puppet shadows or articulated figures. It is worth quoting the zoetrope of the Englishman W.A. Horner, the zoopraxiscope of the Englishman too Eadweard James Muybridge, the phenakistoscope of the Belgian Joseph Plateau and in particular the praxinoscope of the French Émile Reynaud. The latter gave rise to the Théâtre Optique, in the year 1888, wearing a light source to projecting a series of 700 drawings arranged on a rotating disc. The praxinoscope is the foundation from which developed the technique of animation as it is known today. Since the first attempts at animation until the invention and development of the cinema, the animated cartoon technique has always evolved. The first breakthrough came from James Stuart Blackton, who in Vitagraph Studios in New York, used the idea of “stop” the trickery movies to produce animation. 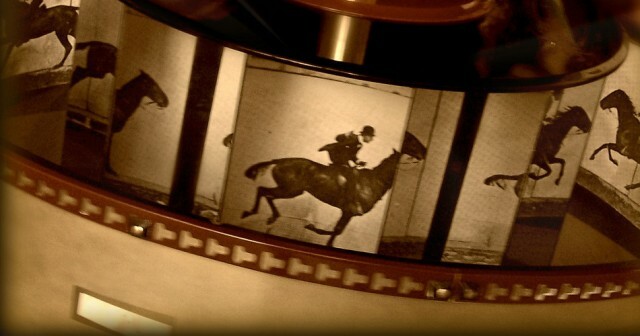 The result was the first animated film Humorous Phases of Funny Faces (1906). Who dispute with Blackton this title is Émile Cohl, the French author of approximately 300 films of the genre, including Fantasmagorie (1908), that follows the Blackton style, but achieves greater fluidity and is widely considered the true first animated film. With the successful development of the projections, the animation passed of an ingenious technique for an individual toy and an appeal to entertain and astonish, to become a spectacular way to tell stories to a large audience.